It can be hard to motivate kids to write. It can be even harder in summer when it’s sunny out and there are so many fun distractions. 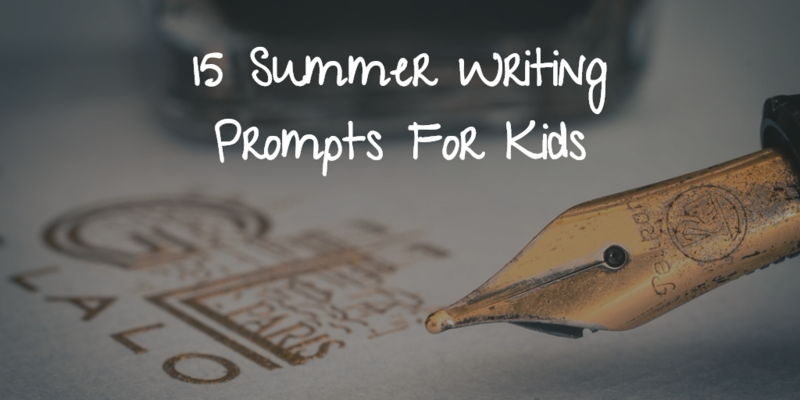 I put together this list of writing prompts to help motivate kids to keep writing all summer long. 4. Your dad takes you to the pool on a hot day. When you get there, instead of water, it is filled with Jello. What do you do? 5.You are off to Camp Flaming Arrow! You are excited for your first overnight camp, but when you get there, you begin to suspect that all of your camp councilors are actually ware wolves. What do you do? 6. A postcard arrives in the mail, addressed to you. On the front is a picture of a sunny beach. On the back, is a note, signed by you. You’ve never been to the beach. What do you do? 7. One day, you are swimming in the river with your friend, Dave. Dave sees something in the forest nearby. He says it’s a gnome and runs off into the woods. Do you follow him? What do you find? 8. It’s 100 degrees out. You are hot and sweaty and your air conditioner broke. Your mom brings you a popsicle to help cool down. Your dog looks at you and says “Hey! What about me? I’ve got a fur coat! Don’t you think I’d like a cool treat? !” What do you do? 9. One evening, you are catching fireflies in jar in your backyard. You take them inside to observe them. You realize that one of the glowing creatures is not a firefly, but a fairy! What do you do? 10. Your best friend calls and asks if you can come to a sleepover at her house. When you get there, she says she has a special guest. The guest is an alien from outer space! What happens next? 11. A large, white owl flies up to your house. It has a package in its talons. It drops it on your lap and perches in a nearby tree. What do you find when you open the package? 12. You take a trip to the museum with your family. Somehow, you lose sight of them. You walk down a long hallway and see a door that seems to be glowing. A sign on in says “Keep Out,” but you can’t resist. What do you find when you open the door? 13. You return home from a day at camp to find a “For Sale” sign on your house. Your parents tell you that you are moving to China. What do you do? 15. It’s the 4th of July! Your family takes you to a fireworks show. It’s the most amazing display of fireworks you’ve ever seen. You decide you want to get closer to see the fireworks being set off and you find that there are no fireworks at all. It’s actually a group of wizards sending beautiful designs into the sky with their wands! What do you do?